The journal Pediatrics has published a special supplement on the health and medical treatment of children and adolescents with autism spectrum disorder (ASD) and other neurodevelopmental disorders. The issue highlights treatment guidelines for physicians, and research reports on medical issues of interest to families affected by ASD. As families know, many individuals with autism have associated medical conditions. These include seizures, sleep problems, gastrointestinal disorders, psychiatric conditions and nutritional deficiencies. In addition to compromising a child’s health, these issues can affect behavior, development and a child's ability to learn. 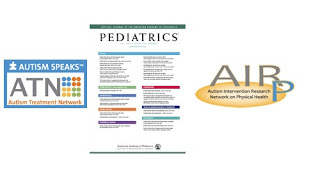 The leadership of Autism Speaks Autism Treatment Network (ATN) – through its federally funded work as the Autism Intervention Research Network on Physical Health( AIR-P)* – contributed significantly to the supplement. James M. Perrin, M.D., FAAP, and Daniel Coury, M.D., FAAP, served as co-editors. Dr. Perrin directs the AIR-P and also the ATN Clinical Coordinating Center, at Boston’s MassGeneral Hospital for Children. Dr. Coury serves as the AIR-P and ATN medical director, at Nationwide Children’s Hospital, in Columbus, Ohio. “Our hope is that this issue will help inform the health care community and parents about the needs of children with autism and the evolving knowledge, practices and guidelines that can ultimately improve the quality of health care that children and their families receive,” Drs. Perrin and Coury write in their introduction. 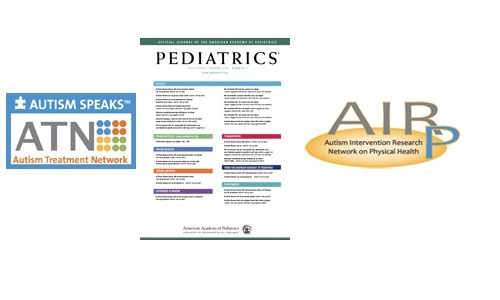 The Pediatrics supplement includes recommendations for physicians developed by Autism Speaks ATN and AIR-P. These address the issues of constipation, insomnia and medications for associated psychiatric conditions. It also includes studies on psychiatric medications, complementary and alternative treatments, sleep and behavior problems, as well as nutrition (italics ours). “Together, these articles provide a broad look at issues that families face as they interact with the health care community and seek the best treatments available for their children with autism and related neurodevelopmental disorders,” Drs. Perrin and Coury write. Below are summaries of some of the supplement articles. Several highlight the funded research activities conducted by the AIR-P at Autism Speaks ATN centers. Others used information from the ATN Registry. Many individuals with ASD take medication for associated disorders such as hyperactivity, anxiety or depression. Yet there has been little research on the extent of their use. Looking at information from over 2,800 children in the ATN Registry, researchers found that 27 percent of children and adolescents with ASD were taking one or more psychotropic medicines. The rates increased as children got older. Among children aged 3 to 5 years, 11 percent were taking one or more medications. This rose to 46 percent among 6- to 11-year-olds and 66 percent among 12- to 17-year-olds. “Families often have difficulty determining whether medication is needed as part of the treatment plan for a child or adolescent with ASD and challenging behavior,” the authors write. Through its AIR-P funding, the ATN has developed a Medication Decision Aid Tool kit to help families and providers with such decisions. The following Autism Speaks ATN centers worked on this study: Nationwide Children’s Hospital, Columbus, Ohio; Holland Bloorview Kids Rehabilitation Hospital, University of Toronto, Ontario; Cincinnati Children’s Hospital Medical Center, Ohio; University of Colorado and Children’s Hospital Colorado, Denver, Colo.; University of Rochester, N.Y.; Oregon Health & Science University, Portland, Ore.; Columbia University, New York, N.Y.; and Mass General Hospital for Children, Boston, Mass. This study of 3,066 children from the ATN Registry confirmed that, among children with autism, those with higher levels of ADHD symptoms tend to have greater impairment in adaptive skills and poorer health-related quality of life. The researchers looked at impairment in communication, socialization, daily living skills and quality of life in the areas of social, emotional, physical, school and psycho-social functioning. They recommended physicians look for ADHD symptoms in children with ASD, and consider them in developing treatment plans with parents. The following Autism Speaks ATN centers worked on the study: Oregon Health & Science University, Portland, Ore., and Nationwide Children’s Hospital, Columbus, Ohio. An estimated 50 to 80 percent of children with ASD have sleep problems. Some research shows – and many parents suspect – that poor sleep worsens behavior problems. This study of 1,193 children aged 4 to 10 years old enrolled in the ATN Registry confirmed that sleep problems are associated with increased problem behavior and emotional issues such as emotional reactivity and anxiety. The study also found that sleep problems were related to poorer communication and socialization skills. The following Autism Speaks ATN centers worked on this study: Oregon Health & Science University, Portland, Ore., and University of Colorado, Denver, Colo.
Past research has suggested that parent-led behavioral interventions can reduce insomnia in children with ASD. But researchers still face the hurdle of how to best educate parents on the use of these methods. This multi-site study found that simply providing parents an informational pamphlet about sleep does not produce significant improvements in children's insomnia. This study was the first stage in the development of parent-training sessions. The following AIR-P and ATN centers participated in the study: Vanderbilt University Medical Center, Nashville, Tenn.; The Children’s Hospital Colorado, Denver, Colo.; and the University of Toronto/Hospital for Sick Children, Toronto, Canada. Many children with ASD have food aversions and digestive difficulties. But does this lead to nutritional deficiencies? This large, multi-site study analyzed the nutrient intake of 367 children with ASD based on the average requirement for the nutrients. Where possible, researchers compared this to a comparison group that was representative of the general pediatric population. The researchers found that children with ASD had insufficient intakes of calcium, choline, fiber, magnesium, phosphorus, potassium and vitamins A, D and K. Some of these differences, however, were limited to particular age groups and most were not statistically different from what is seen among children more generally. Children with ASD had sufficient intake of iron, B6, B12 and folic acid from their diets. The authors concluded that although many children with ASD don’t consume recommended levels of some nutrients, they may not differ greatly from typically developing children. The following AIR-P and ATN centers participated in the study: Cincinnati Children’s Hospital Medical Center, Cincinnati, Ohio; The Children’s Hospital Colorado, Denver, Colo.; University of Rochester, Rochester, N.Y.; University of Pittsburgh, Pittsburgh, Penn. ; and the University of Arkansas for Medical Sciences, Little Rock, Ark. Some previous studies have found iron deficiency to be more common among individuals with autism. This multi-site study of 222 children found that children with autism were no more likely than other children to have iron deficiency. Fewer than 2 percent had iron intake lower than the recommended requirements. Only 1 percent suffered from an iron deficiency. Interestingly, 8 percent of children exhibited low levels of iron as measured in their blood serum. The researchers suggest this deserves further investigation. The following AIR-P and ATN centers participated in the study: The Children’s Hospital Colorado, Denver, Colo.; University of Rochester, Rochester, N.Y. Cincinnati Children’s Hospital Medical Center, Cincinnati, Ohio; University of Arkansas for Medical Sciences, Little Rock, Ark. ; and University of Pittsburgh, Pittsburgh, Penn. This report reviewed the current knowledge around GI issues in individuals with autism and proposed priority areas for further research. These include a review of the prevalence of GI conditions among children with ASD, as well as of the underlying biology, treatments and associated nutritional issues. The report integrates recommendations from an Autism Speaks-supported symposium and workshop on GI in ASD. Members from the following Autism Speaks ATN centers were authors on this paper: Nationwide Children’s Hospital, Columbus, Ohio; University of Arkansas for Medical Sciences, Little Rock, Ark. ; Cincinnati Children’s Hospital, Cincinnati, Ohio. * Under the Combating Autism Act, the Maternal and Child Health Bureau of the Health Resources and Services Administration funds Autism Speaks ATN to serve as the Autism Intervention Research Network on Physical Health (AIR-P) and conduct research that can improve the health of children and adolescents with autism spectrum disorders (ASD) and other developmental disabilities. This work and the supplement are supported by cooperative agreement UA3 MC 11054, through the U.S. Dept. of Health and Human Services, Health Resources and Services Administration, Maternal and Child Health Research Program with the Mass. General Hospital.